This 1920s masterpiece of French Quarter architecture hides a secret tunnel used by Albert Einstein. Cheesewright Studios Building Grand Room circa 1927 via the Pasadena Museum of history. Cheesewright Studios building circa 1927 via the Pasadena Museum of History. Edgar J. Cheesewright’s name has been lost to history, but in his day he was highly revered and is still considered the top interior designer of the 1920s. Born in England in 1880, he became famous enough to be asked to participate in a White House renovation that included some of the building’s most famous and memorable doorways. "The Star Factory" cranked out Hollywood stars like nobody's business. 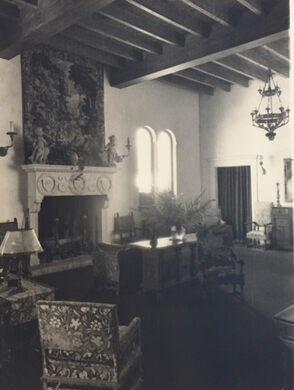 After moving to the U.S., Cheesewright worked on such high-profile projects as Hearst Castle, the Hollywood Roosevelt Hotel, Santa Maria Inn, and Greystone Mansion. His work at Hearst Castle is beloved, while his beautiful and influential design work at Greystone Mansion was tainted by the murder of his client, Ned Doheny, who was killed less than one year after moving into the completed 46,000-square-foot mansion. As business grew, Cheesewright chose Pasadena for his studios because he had so many clients there. Millionaires Row was in construction on South-West Orange Grove, with mansions lining the street. 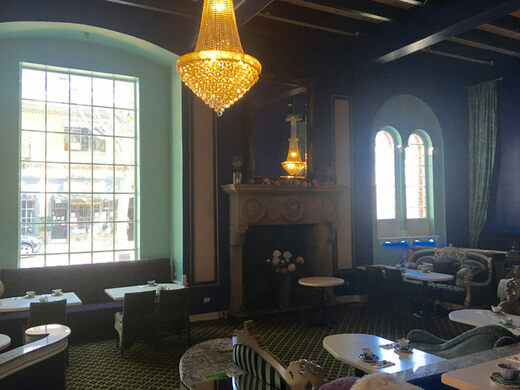 The designer choose French Quarter style for his studios, and brought over an architect from France to help him create a period example of the beauty of French Quarter. There are lovely arches and wrought iron gates all over the building, and an Italian porpoise fountain on the Front Court. The Cheesewright Studios Building in Pasadena is also graced by two of his famous doorways, identical to the ones you can see in the White House. Cheesewright ran a large operation in his studio building with a top-of-the-line cabinetmaking shop in the back, shops in front and offices upstairs, employing altogether 118 people. 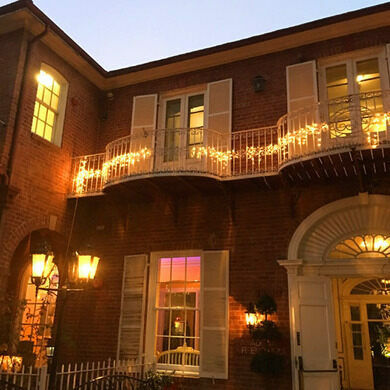 The whole block was influenced by this great building; from one end of Green Street to the other, you can find French Quarter architectural details inspired by the studios building. Sadly, 1929 came and with it the Great Depression. Finding his market dried up, Cheesewright sold his building for a fraction of what he had put into it. In the early 1930s the US Navy quietly moved into the building, setting up the Naval Research Center to conduct top-secret military intelligence projects, and also to make use of the former wood and metal shop space Cheesewright had built. A tunnel was dug between Cal Tech and the studios building for Albert Einstein at that point, where he had a secret lab in the basement and could go back and forth to Cal Tech without being seen. The building stayed with the Navy up until 1983, and several important, historical military projects were completed there. It is impossible to learn anything about this time online, all the information has been removed due to its sensitive content. If only the walls could talk! Such stories there are to tell and still to learn, about the fabulous Cheesewright Studios. The history on this tour is unknown and the only way to learn it is to take the tour. Cheesewright is long overdue for a revival. Anyone who loves history or architecture, or both, will love this tour. Call 626.795.5599 and ask for Ginny for tour information. Colorado Boulevard’s historic bookstore, operating since the bustling city of Pasadena was merely some orange groves and a few ostrich farms. A unique botanical garden housed in three giant geodesic domes.